Rogen Wilderness Canoe Expedition is a challenging self-guided wilderness canoe tour in the remote mountain region of Rogen Nature Reserve in north-west Sweden, beginning on the Swedish side of the border and crossing over to the Femundsmarka National Park in Norway to end at a choice of two finish points on the Norwegian side. For those with previous experience of paddle tours, extensive experience of the outdoors and a good level of fitness and strength, Rogen Wilderness Canoe Expedition offers extended canoe touring through a stunning landscape of lakes, islands, peninsulars and bays. The area is also well-known for its grayling and trout fishing - a marvellous way to supplement your camping provisions! Some challenging land transports over rough terrain are required during the tour. Photo: Euan Turner DMh Photo. 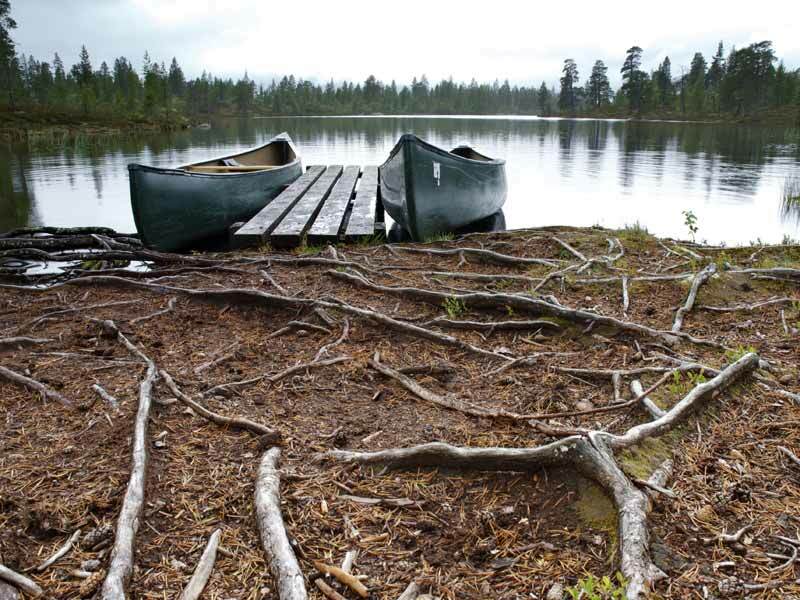 Starting with a lift of around 700m to the launching point, your canoe expedition continues down to Stortandsjön ("Large Tooth Lake"). 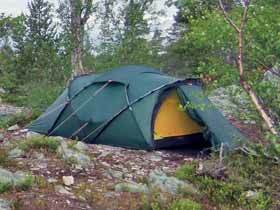 Many choose to allow a couple of days here to explore the area, perhaps leaving the canoes for a while to hike to the lakes of Bredasjön and Våndssjön. You make your way west and into Norway, planning your own route and distance covered each day, camping wild along the way. There are also wind shelters at certain points in the park, at which you are welcome to overnight if unoccupied. These spots also have fireplaces, where you are permitted to make a fire. We recommend that you allow plenty of time to cross from the western shore of Lake Rogen down to Femunden - this is a very challenging stretch of the tour. Between Nedre Roastan and the Röa river, the going is steep with long carries over rocky terrain but is interspersed with glorious paddling on sections of calm water. 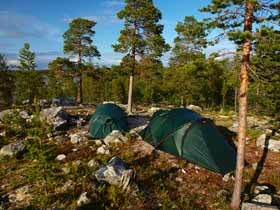 The Rogen and Femundsmarka reserves have a network of wind shelters and camping spots for overnights. Photo: TS. For the last section of your canoe tour, you can choose one of two possible routes - north along Lake Feragen to be collected on the northern shore, or west through a beautiful network of small lakes to end at Röros. There are two portages of approx. 700m and 500m required for this tour in addition to a large number of other land transports over steep and uneven terrain, and at times you will almost be climbing with the canoe. There are also many sections of rapids at which you must take the canoes and equipment out of the water with land transports of 2km or more in a single stretch. Rogen Wilderness Canoe Expedition is a tough but very rewarding paddle tour in a stunning and remote area - an ideal choice for the experienced outdoor enthusiast and a tour to give a lifetime of memories! Go to the canoe centre for information at 12.00 as soon as the bus arrives. You will have an opportunity to shop for provisions, purchase any fishing licences, etc, before transfer. We recommend using the first day of your tour to explore the many bays of the lake system and become acquainted with the terrain, the equipment and the distance you can reasonably be expected to cover in a particular time. 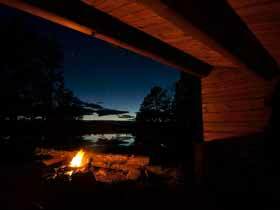 There are one or two lean-to shelters in the area where you can spend the night and also make a fire. This is also an excellent area for pike and grayling fishing. From here to reach the larger Lake Rogen requires a carry of around 500m to the lake at Tandsjön, followed by shorter stretches of paddling and carrying to reach the larger lake of Rogen, offering marvellous paddling through small sections of rapids (normally max. grade 1) and flat water. Once out onto the lake, we recommend you head west, perhaps via Käringsjön and all the small islands to Rödviken by Bustvålen and there prepare yourself for the challenges of crossing over towards Femunden. You may wish to take a day to hike to the top of one of the peaks in the area - the possibilities are endless! This is a very remote area, with large stretches of completely pathless terrain, with no walkboards and no waymarkings. 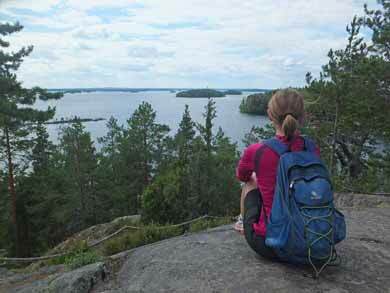 We recommend allowing 2-3 days for this stretch, a landscape of long cliffs and rocky terrain. IMPORTANT: Rapids on the Röa Älv: Under no circumstances should you paddle any part of the rapids along the Röa Älv (Röa River), a stretch of around 6km. The canoes and all equipment must be taken out of the water and carried, requiring portages of 2km or more in a single stretch. You should allow 2 days for this part of the tour. The number and length of land transports required during this section will vary depending on water levels, weather conditions and time of year. While it may be possible to paddle on some sections of still water between the rapids, if choosing to do this, you must scout ahead on foot beforehand to check carefully where to take the canoes out of the water. It is often not possible to judge when on the river when you are approaching a section of rapids. Although some stretches of rapids may begin at fairly low grade, many end in challenging whitewater and waterfalls. The river is grade 2-5. The canoes and buoyancy aids are not intended for use in these conditions under any circumstances and you must exercise extreme caution during this part of the tour. Once at the Röa estuary, the tour continues along Femunden's eastern short towards Nordvika. The water in Lake Femunden and Lake Feragen later in the tour can very easily and very quickly become rough in windy weather. You must stay close to land when paddling here. NB: Depending on weather and wind conditions, it can take much longer than anticipated to paddle Lake Femunden and Lake Feragen. You must plan your itinerary to include contingencies for delays to ensure you reach the end point at the agreed time. OPTION 2: End point in Röros (most challenging option). The last days of your tour offer easy paddling with no extended portages. 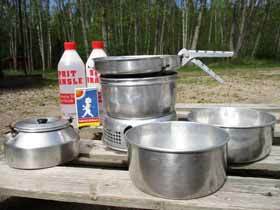 This option is suitable for those who have a little extra time to spend out in the wilderness. We recommend you plan to reach the end point in Röros with at least a couple of hours to spare to look around the village. Pick-up at the end point in Röros at 10.00 or Feragen at 11.00 (depending on tour chosen) to be back in Funäsdalen around 12.30. Recommended duration 8-12 days. Provided weather conditions are suitable, this route can be completed in 8 days. However, we strongly recommend you add additional days to allow for delays due to weather and wind and other variations to your planned itinerary. For average participants, we recommend 10-11 days, with drop-off/pick-up + 7 days' paddling + 3 days for hiking, contingencies, etc. Recommended duration 10-15 days. Provided weather conditions are suitable, this route can be completed in 10 days. However, we strongly recommend you add additional days to allow for delays due to weather and wind and other variations to your planned itinerary. For average participants, we recommend 12-13 days, with drop-off/pick-up + 9 days' paddling + 3 days for hiking, contingencies, etc. During your canoe adventure you will need to take into account factors such as weather conditions, your varying energy levels and personal preferences, and must be prepared to be flexible and adapt your plans accordingly. NB: This experience is suitable only for even-numbered groups (2, 4, 6 persons, etc). It is not possible for odd-numbered participants to paddle their own canoe due to the land transports involved in this tour or to paddle three persons in one canoe. Maps: Maps are essential for this tour and are available to hire as an optional extra - please see below. Food: There is no food included. You must bring all food needed during the tour with you from the beginning. There is a food store in Funäsdalen. There is one cabin within the reserve near the start of the tour with a small provisions store open during July and August. However, you must not rely on this for essential provisions, as the cabin may not be open during your tour or stocks may be limited. Maps can be purchased from www.themapshop.co.uk or locally on arrival. Swimming ability required for all participants. All participation at own risk. Minimum 2 adults required. Minimum age 16. Even-numbered groups only (2, 4, 6 persons, etc). This experience is not suitable for odd-numbered groups. Rogen Wilderness Canoe Expedition is a very challenging tour. You should be in general good health and have a very good level of fitness and strength. Participants must have previous experience of multi-day canoe tours and be confident travelling independently in the outdoors. Rogen is a very remote area with little infrastructure. As a northerly location, the water may be very cold, and in windy conditions the lakes can be choppy. Land transports require carrying the canoe over rough terrain and can be very demanding. 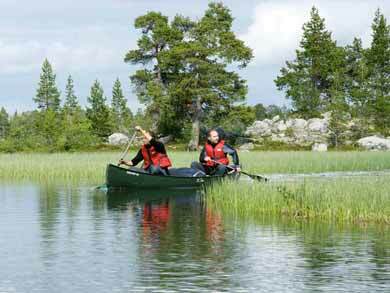 Unlike Discover Wilderness Canoeing in Rogen, the Expedition commits you to covering a particular distance in the time available, and land transports along the Röa Älv section in particular can be very challenging. 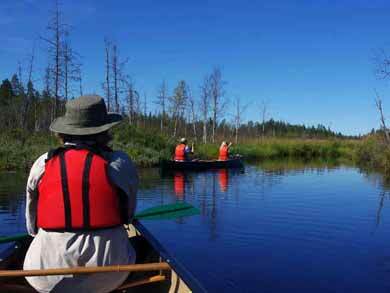 Rogen Wilderness Canoe Expedition is ideal for groups - please contact us to discuss your requirements. Femundsmarka National Park lies on the Norwegian side, bordering Rogen in Sweden to the east and Lake Femunden to the west. The park was created in 1971 with an area of 381 square km, increased in 2003 to 573 square km. More than 10% of the Femundsmarka park is water, with many of the watercourses running from the east into Femunden. The waters are rich in fish, the most important species being trout, Arctic char, grayling, pike, burbot and perch. It is also a very important nesting area for wetland birds. The highest point in Femundsmarka is Stor Svuka at 1415m. Femundsmarka is Norway's most southerly area of the indigenous Sami people and has been used for reindeer husbandry since the 1600s. You can choose to fly to Stockholm or Gothenburg airports. From here, you travel by night train + bus connection to Funäsdalen. You can also choose to fly to Oslo airports and travel by hire car (driving time 6-7 hours). 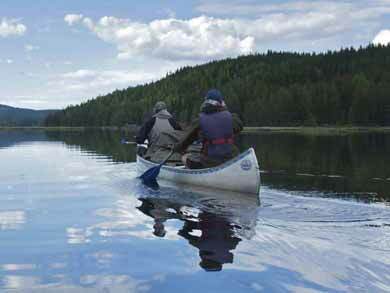 Discover Wilderness Canoeing in Rogen is a more accessible version of this tour.